Nothing screams summer in the south like fresh picked peaches, and I heard today the peach crop has already matured because of our mild winter. Everyone knows how to make a peach cobbler, the standard peach dessert, but here’s a recipe for a delicious cold dessert that’s perfect on a hot summer’s day. It’s also an easy one, requiring no oven time (great for those of us with hot 50’s Ranch homes featuring 8′ ceilings). You can substitute canned peaches if you’d like, or if peaches aren’t readily available in your area, but nothing beats a ripe, juicy peach! In a mixing bowl, empty the peach Jell-O and pour in the boiling water. Stir until Jell-O has completely dissolved, then add the ice cubes and stir until the mixture begins to thicken. Remove any unmelted ice cubes, then fold in the Cool Whip. Put mixture in the refrigerator for about 15 minutes to chill and start to set up. You want it to be the consistency where you can spoon it into the crust, not pour it in. 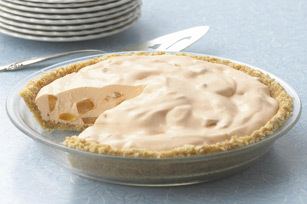 One the Jell-O mixture has cooled and began to set, mix in the fresh peaches, fill the graham cracker crust and refrigerate the pie for at least 3 hours before serving. Slice and enjoy! If you have a lot of peaches, you can make several pies and freeze them. To serve, remove a pie from the freezer and allow the pie to soften overnight in the refrigerator before slicing. This entry was posted in Dessert and tagged cool whip, fresh peaches, graham cracker, Jell-O, No bake pie, peach, summer dessert by quarlj01. Bookmark the permalink.